Saw this strange notice at the Colombo airport immigration today. The notice raises the question are mainland investors attempting to expand their reach into the poultry breeding business in Sri Lanka? 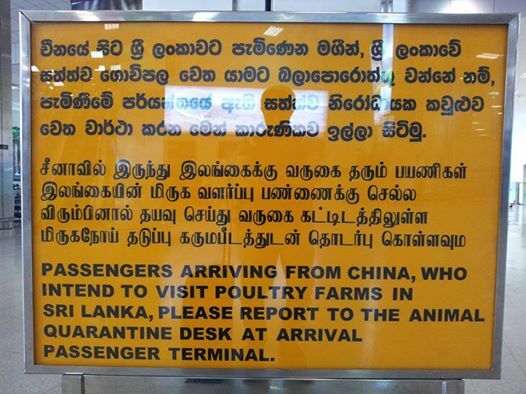 Indeed, Chinese money has flowed into the poultry sector in Sri Lanka. One example is the USD 3.88 million investment by China’s Daan International Agriculture Technology in 2011 to set up a poultry farm in Katugampola in Kurunegala. There are over 25,000 Chinese in Sri Lanka working on various projects with investments ranging from port to telecommunications. Perhaps the Chinese are looking at strengthening investment in the agricultural sector? Next articleOpportunity for tissue paper in Sri Lanka? Pin it with Style at 7-Eleven Malaysia!